Moderate, areas can be difficult due to weather. This three and a half mile hike explores the lesser traveled paths of two well known hiking destinations and a connecting road between them that crosses over Sprague Hill. Starting at a parking area along Putnam Pike for the Durfee Hill Management Area follow the dirt road beyond the gate. The road winds south before first coming to an area on the left with a small waterfall and some old stone work along Brandy Brook. Continuing ahead the road turns to the right. The trail to the left you will return on. At the next split the follow the road to the left and it will come to Burlingame Reservoir. There are some blazes and marks in this area presumably used by cyclists, ignore them for this hike. Next you will cross the earthen dam of the reservoir. The view of is quite nice here. The next part of this hike can be quite difficult after some rain. The unmarked but relatively defined trail turns away from the reservoir. It is a very rocky trail and after some rain can be quite wet and somewhat flooded. Take your time here and be sure to follow the trail. It soon comes to an intersection. Take a good look around and familiarize yourself with the intersection. You will be returning to this point but following a different trail out. At this point turn right and follow the trail to the southwest. This trail is actually Elbow Rock Road and it is fairly narrow, channeled in areas, and travels gradually up Sprague Hill for about a half mile. Much like the previous trail, it is quite rocky and areas and will be wet, almost stream like, after significant precipitation. The trail is also flanked by areas of mountain laurel and hemlocks. Do note that there are “No Trespassing” signs on each side of the trail after you leave the Durfee Hill Management Area. The trail itself lies within a public right of way. Be sure to stay on this trail ignoring other trails that spur off in either direction until you reach the top of the hill at a four way trail intersection with a parking area. The trail to the left is actually the end of Sprague Hill Road and the lesser known small parking area is public parking for Sprague Farm. For this hike continue straight and follow the dirt road slightly downhill. You may notice white dot blazes here. This is part of the Sprague Farm trail network. Soon on the right you will find a narrow unmarked trail that crosses over a large section of outcrop. Turn here and follow the trail that climbs the hill. This is Elbow Rock. There are no sweeping views here but be aware of the edges. The rock is rather large and looms high above the surrounding forest. From here follow the trail over the rock and to the left back down to Elbow Rock Road. Turn left and retrace your steps back up and over Sprague Hill a little over a mile to the intersection that you had familiarized yourself with. From here follow the trail mostly straight, along the main trail, as it winds to the pond. There is a large field to the right if you choose to explore it. Next the trail comes to another earthen dam and a smaller pond on the left. After heavy rains this is also a challenge as an area of the dam is slightly compromised and water flows over it into Brandy Brook. Next there is a small bridge that crosses a stonework channel. Turn right and retrace your steps back to the parking area. Hunting is allowed in these areas, be sure to wear orange during hunting season. Moderate due to navigation, some significant elevation. If you like stone walls and ledges, this is the hike for you. I met with fellow hiker Auntie Beak for this mid afternoon hike in the Pachaug State Forest in Connecticut. She has done this hike on several occasions and it was nice to relax and just follow her lead. The trails here are not blazed, therefore it is recommended to obtain a copy of the map for the forest trails and use GPS. 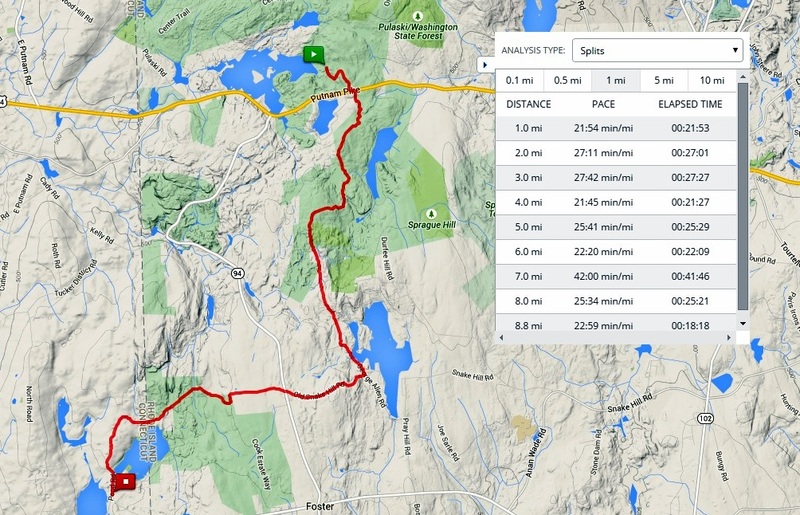 (If you use Auntie Beaks map, linked below, note that we did the southern portion of her overall hike). Starting from the parking area just west of Kinney Brook along Hodge Pond Road we followed the old dirt road south into the forest. The first part of this hike you will continue straight along the main road ignoring side trails. After climbing uphill for a bit we came upon an old stone building. The stone work is quite impressive. Continuing along the old dirt road, immediately following the stone building is an open field with flowers. It appears this might have once been a garden. Further ahead is a seasonal brook and waterfall to the right. Soon after there are some beautiful ledges as well. At the end of the road turn right and start heading northwest. You will start to see more impressive ledges along this stretch. At the next intersection merge to the left. The trail becomes much more primitive and narrow at this point as it meanders through a forest of rocks and boulders. Ahead, seemingly in the middle of nowhere, you will come to a bridge that crosses Dark Hollow Brook. At the next two trail splits stay to the left. You are now in the Town of Griswold. Ahead stay to the right, the trail now winds as it climbs uphill toward an old farm site. The trail soon becomes flanked with stone walls. Take your time here and look around. There is a well here and several old farm tools abandoned years ago. The trail soon comes to another dirt road. Stay to the left here and follow the road back to the paved Hodge Pond Road. Turn right and follow the paved road downhill back to the parking area. You will pass a cemetery along the way. Hunting is allowed here and blazed orange is required during hunting season. There are three blazed trails here that traverse the woods around the Franklin Reservoirs. The trails, green, red, and blue, are very well marked and there is an informational kiosk at almost every trail intersection. There is also a very interesting and unique floating bridge that crosses one of the water bodies. The trails wind through areas of thick pine groves and there are some small hills. There were several swans and geese here. At the spillways of the dams are small waterfalls. There is also a boat ramp for kayaks and canoes as well as a playground and picnic area. This is a great location for kids and/or beginners. For more information go to Easy Walks in Massachusetts. 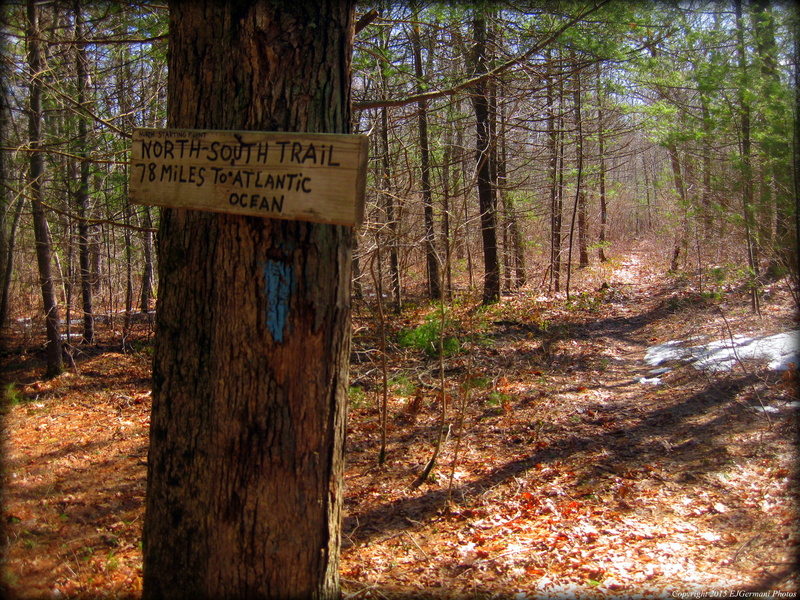 The North South Trail is the longest continuous trail in the State of Rhode Island. It stretches from the rolling and rocky hills of the northwest corner of the state to the Atlantic Ocean at the southern end of the state. The route described here actually starts a little over 2 miles north of the start of the North South Trail in the Douglas State Forest. The North South Trail starts in a location that is not accessible by vehicle. It must be hiked to either from the main parking area at Buck Hill or from Wallum Lake in Douglas. We choose Wallum Lake. 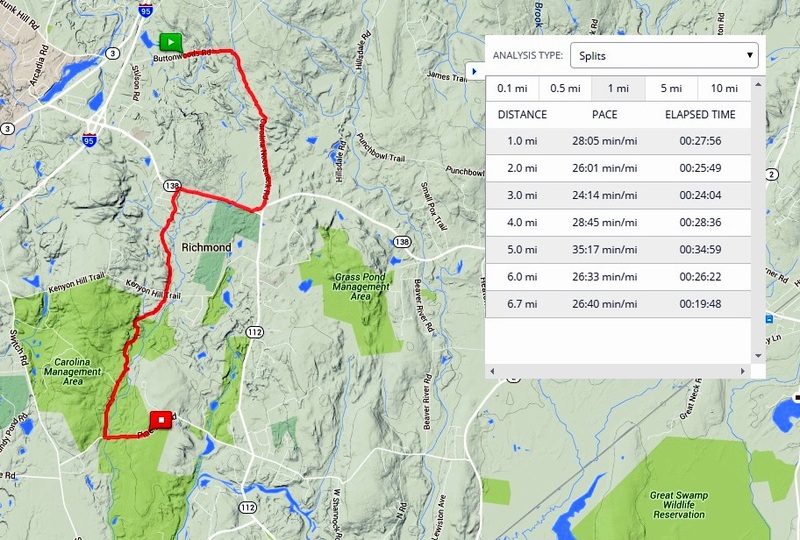 Over its course of nearly 80 miles, this hike meanders through Burrillvile, Glocester, Killingly, Foster, Coventry, West Greenwich, Exeter, Richmond, and finally Charlestown. 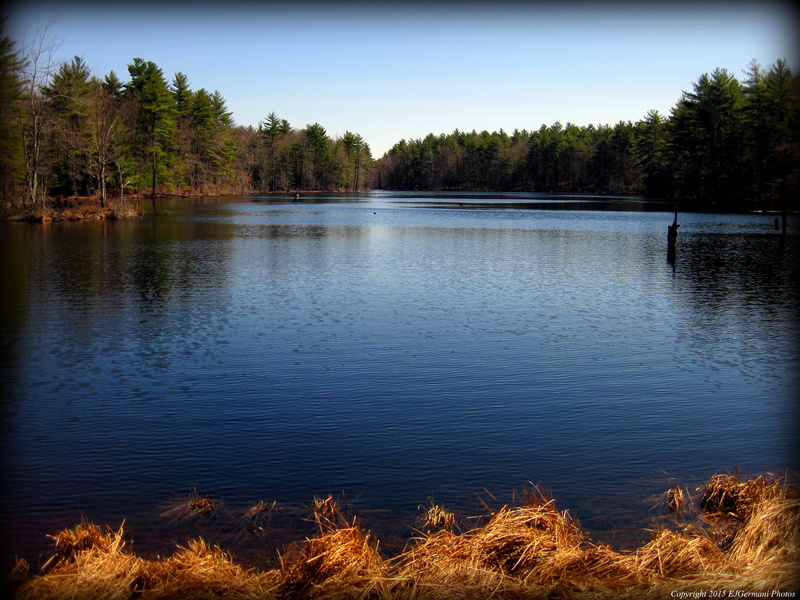 It traverses through Buck Hill, George Washington, Durfee Hill, Killingly Pond, Nicholas Farm, Arcadia, Carolina, and Burlingame, all which are state management areas. Though the hike covers essentially all of the states western management areas, there are still miles of road walking as well. 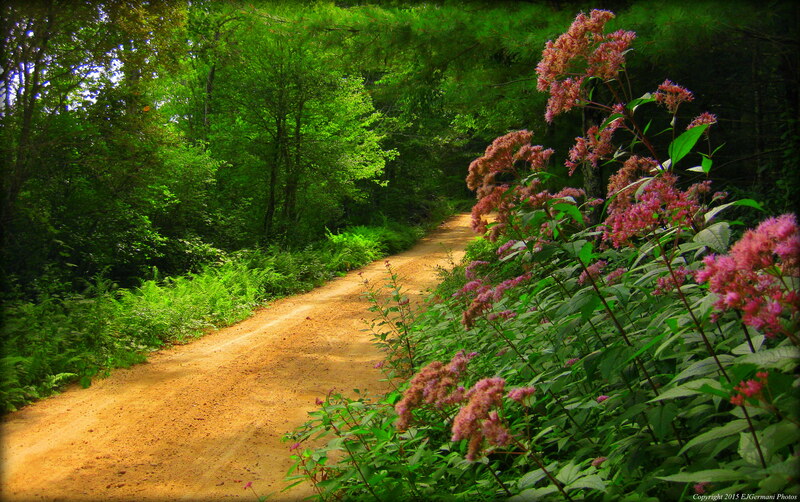 In most cases, the roads are quiet backwoods or country roads. 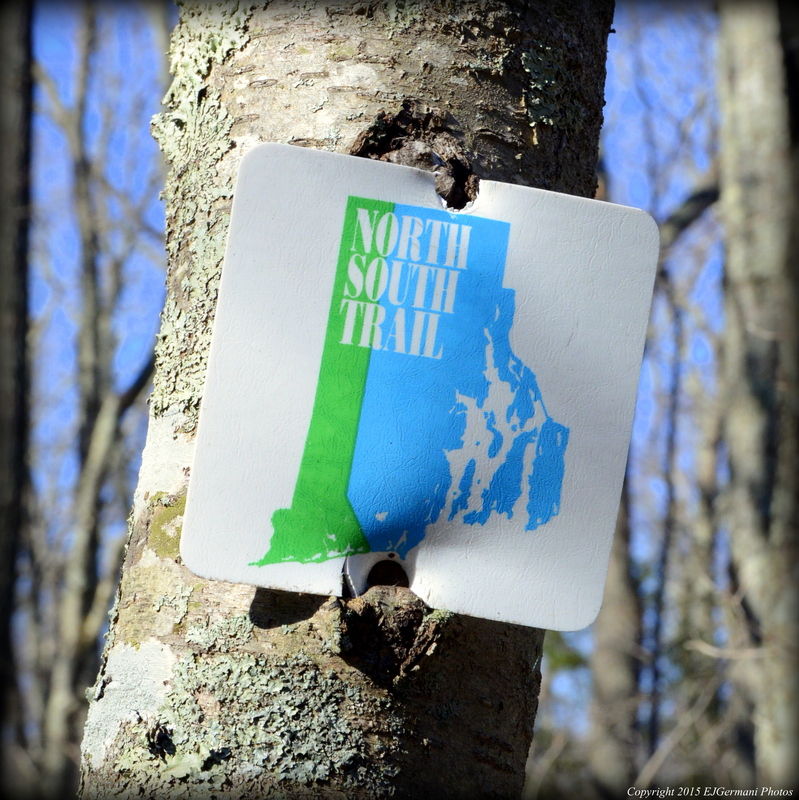 Many hikers and hiking groups, including the North South Trail Council, usually start this hike in Charlestown and head north as described in the Cliff Vanover guide book of The North South Trail. These groups do this hike in 7 or so legs with some stretches up to 13 or more miles. For this hike I was joined by a small group of dedicated fellow hikers. Relying heavily on Mr. Vanovers guide book, we broke the hike into 11 smaller legs and decided to meet every few weeks to complete the task over the course of time from April to November. We also decided to hike from the north and head south tackling the higher terrains first. 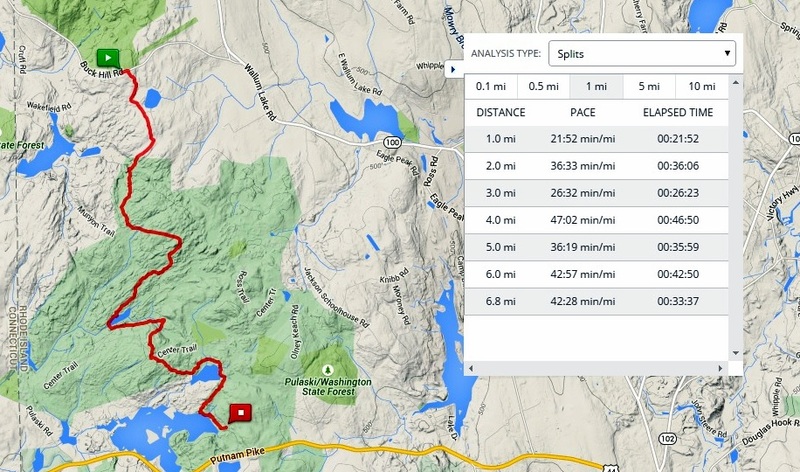 Moderate, difficult in some areas, with some significant elevation and rocky footing. This leg of this hike was in fact a hike of 5.9 miles. The first 2.2 miles of the hike was to reach the beginning of the North South Trail from Wallum Lake in the Douglas State Forest. We started the hike from the parking area at the north end of Wallum Lake where the boat ramp is. From here you can follow the paved road leading southwest away from the parking area. The road will eventually loop to the north. About three tenths of a mile from the parking area you will come to an intersection with a sign on a tree indicating that you have reached the Coffee House Loop. Here you turn left. We then followed the blue blazed Coffee House Loop as it gently climbed up and over hills. Soon we came to an intersection, this is where the Mid State Trail is. 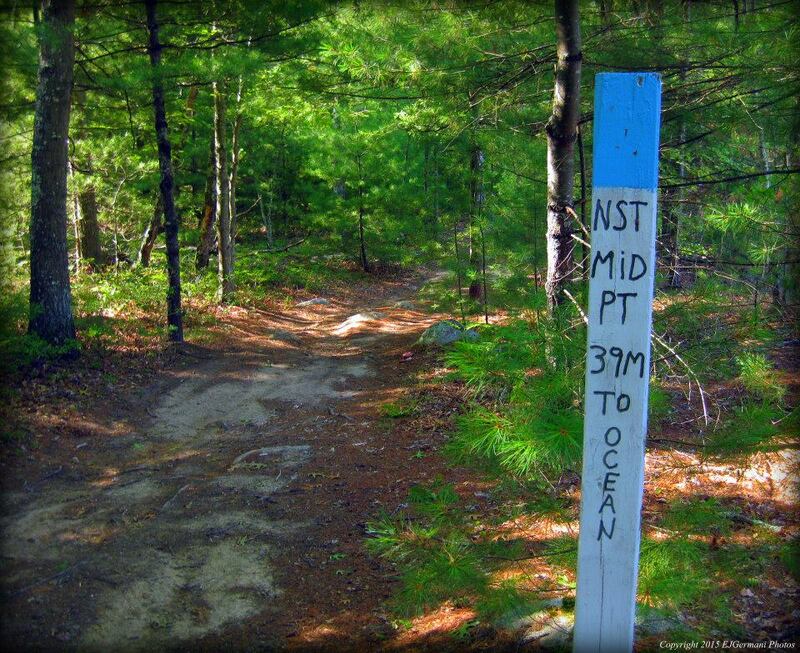 If you were to turn to the right the Mid State Trail will lead you to New Hampshire. The Coffee House Loop turns right here as well. Straight ahead the Mid State Trail continues to the Rhode Island border. We continued straight along the yellow triangle blazed Mid State Trail. The trail starts to descend downhill for a bit. Soon we came to another intersection. Here we turned left following the blazes for the Mid State Trail. Along this stretch the trail is flanked by stone walls as it climbs back uphill. Soon the trail bends to the right. At the bend is a rather impressive cellar hole worth checking out. We then continued following the Mid State Trail. It takes an abrupt left turn onto a narrower path before returning to the wider trail. This is essentially a detour in the spring as the wider trail becomes impassable due to flooding. At the next intersection an unblazed trail goes to the right. This trail would eventually lead you to the Tri-State Marker. We continued straight for a little bit longer. We soon reached the end of the Mid State Trail. At the state line is a large stone indicating the end of the trail. Straight ahead is the trail that would lead to the main parking area at Buck Hill. The trail to the left is the beginning of the North South Trail. There is a sign here the reads “78 miles to Atlantic Ocean”. We then followed the blue blazed trail as it followed the Rhode Island-Massachusetts border. The trail, narrow, becomes a little more rocky as it climbed slightly uphill. Then the trail starts to head in a southeast direction coming to the first area of significant elevation. The trail dips into a ravine. 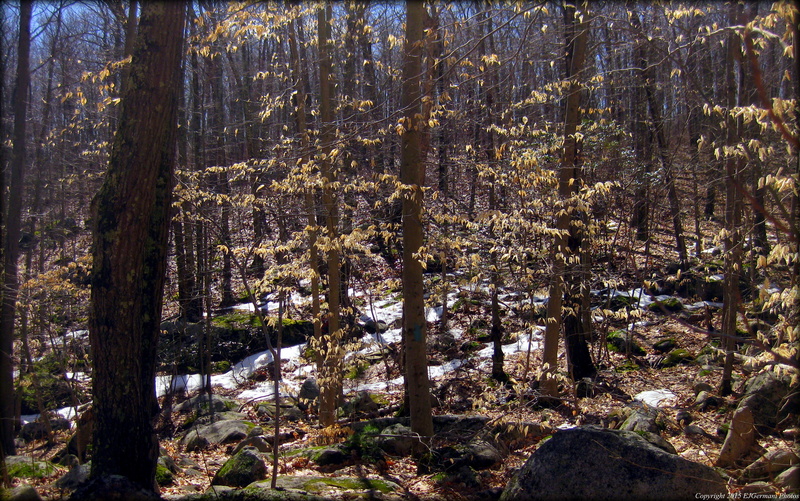 At the time of this hike there was still some snow on the ground and some of the lifeless beech leaves managed to stay on the trees over the harsh winter. The sun was coming through the trees at just the right angle for an absolute picturesque scene. At the toe of the slope there was the first of several stream crossings. From here the trail shot upward nearly 50 feet in elevation. The trail then meandered through boulder fields and areas of rocky footing, climbing up and down some more hills, and crossing some more small streams. Soon, through the trees, we could see Wallum Lake and a water tower across the lake. We then came to a box on a pole where, if you choose, you can sign a registration book. There are several entries in the book dating back to 2010. The trail next comes out to a dirt road named Benson Mountain Trail. Here we turned left and followed the blazes onto the road. We followed the road a short distance before turning right and back onto a narrower blue blazed trail. The trail then continues in a general southerly direction. The footing again gets rocky in areas. Ahead is a large ledge just off the trail. It is worthwhile to take the short unmarked spur trail up to the top for an impressive overview of the boulder field below. Be careful not to get to close to the edge here. After the short detour we continued following the blue blazes. The next feature is a small pond. The trail wraps around the west and then the south side of the pond. At the time of this hike the wood frogs were out. The first true sounds of spring. From here the trail then follows a valley between Buck Hill and Badger Mountain, passing by some impressive boulders and then comes to the last stream crossing. This steam crossing is known as Boiling Spring. From here the trail continues south coming out to Buck Hill Road. We turned right and followed Buck Hill Road to Staghead Parkway. This is where we ended the first leg of the hike. The North South Trail passing through a ravine in Buck Hill. Moderate, difficult in some areas, with some elevation, rocky footing, and stream crossings. Starting at Buck Hill Road at Staghead Parkway in Burrillville, we began leg 2 of our statewide trek. The first 0.8 miles of this hike winds southward through a residential neighborhood along Staghead Parkway and then Staghead Drive. The telephone poles are marked with blue blazes. At the end of Staghead Drive we turned right on a gravel road that led into the wooded area. This road is the Wilson Trail and the wooded area is the extreme northern section of the George Washington Management Area. About 0.4 mile along the Wilson Trail start looking for the North South signage to turn left onto a narrow cross country trail. The blue blazes that most of the North South Trail is marked by becomes non-existent through the George Washington Management Area. The trail along this area is marked with small white plastic markers with a green/blue emblem of Rhode Island (see photo below) and an occasional homemade sign. We turned here following the North South Trail signage and encountered our first hill of significance. Overall this leg was by far easier than the first leg as far as the ups and downs of the hills. Soon we came to an area of clearing for an underground pipeline. We continued straight ahead following the narrow trail that eventually came out to another gravel road. Here we turned left on the gravel road known as Munyan Trail and followed it to the next intersection where another gravel road turns to the left. We continued straight following what was now the Richardson Trail. Along this stretch we came across a square shaped watering hole. The reflections of the trees on the water were quite impressive. We then continued ahead soon coming to an intersection. The orange blazed portion of the Walkabout Trail crosses here. If you were to continue straight or turn right the trails would soon lead you to Pulaski Park. We turned left here following the orange blazes as the North South Trail now follows portions of the Walkabout Trail. (The Walkabout Trail system has three separate loops. 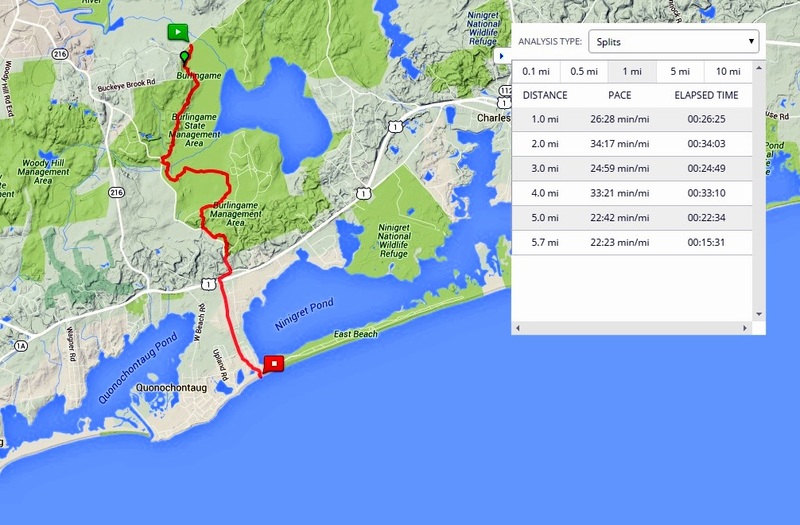 The orange blazed 8 mile loop, the red blazed 6 mile loop, and the 2 mile blue blazed loop. We would be on a part of all while following the North South Trail through this area.) This narrow trail soon starts following the shore of Richardson Pond. There was plenty of evidence of beavers in the area. At the end of this short trail we turned left and crossed the dam that holds back the pond. The view of the pond is quite impressive here. We decided this was a good spot to take a break and to take in the beauty of the area. We then continued crossing the timber bridges and climbed slightly uphill to the next intersection. We followed the orange blazed trail to the left. We saw an owl along this stretch and the ground from this point forward got a little muddy in places. We soon came to a trail on the right that was blazed red. The North South Trail turns right here and then follows the red blazes of the Walkabout Trail system. Soon this trail crosses the Center Trail, another gravel road. We continued straight ahead following the red blazed trail. Next we came to another trail intersection where we turned left where the red and orange trails join together. From this point forward we followed the orange blazes to then end of this leg. Along the way the blue blazed 2 mile loop trail joins with the red and orange as the trail follows the shores of both Wilbur Pond and the Bowdish Reservoir. Also along the final stretch there are several stream crossings, boardwalks, and some quite impressive boulders. This leg of the hike concludes at the parking area by the beach at the George Washington Campground. Marker For The North South Trail. Richardson Pond in the George Washington Management Area. Moderate with some elevation and road walking. 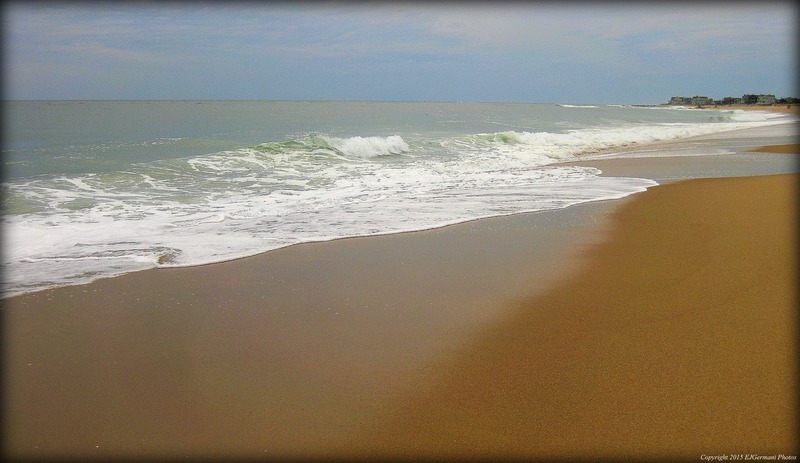 Continuing from the George Washington campground in Glocester, we continued our trek toward the Atlantic Ocean. From the parking area we followed the road towards the entrance of the campground. At the gatehouse we turned left and followed the dirt road uphill until we came to a red gate. Here we turned right and stayed to the right at the trail split. We followed the trail about two-tenths of a mile following the blue blazes until we reached a narrow trail on the right between two campsites. Following this trail we were soon out to Route 44. We crossed the highway and followed it a very short distance to the east, then turned onto Durfee Hill Road and followed that for about one-tenth of a mile. The North South Trail then turns left onto a trail that parallels Durfee Hill Road before crossing it and entering the Durfee Hill Management Area. Continuing ahead the dirt road splits. We followed the blazes to left on a dirt road as it winded through a forest of beech trees, maple trees, and mountain laurel. One of my fellow hikers is quite knowledgeable about wild flowers and was pointing out quite a few including some birdfoot violets. At the next split we stayed to the left which is part of Willie Woodhead Road. This stretch was a little muddy and a little buggy in areas as it passed an area to the right known as Dark Swamp. Although most of the trail along this stretch is blazed in the traditional blue blazes that delineate the North South Trail, some of the blazes were yellow with “NST” inscribed in it. A dirt road soon appeared on the right. Here there is a cellar hole worth checking out. The trail then continues straight leaving the Durfee Hill Management Area and soon becomes a gravel road with homes on each side and some ledges to the left. Just before the four mile mark of the hike the gravel road becomes a paved road and the next two and a quarter miles are walking on paved roads. At the end of Willie Woodhead Road on the left is a parcel with a stone wall. Just inside the wall is another cellar hole. At this intersection we then turned left onto George Allen Road. There is no sign for George Allen Road but there is a sign for Pine Hill Road to the right. Soon we were passing Ponaganset Reservoir on the left before making our turn to the west. At Old Snake Hill Road we turned right and started a up hill climb for about six tenths of a mile. At the crest of the hill is the highest point that North South Trail would reach which is just over eight hundred feet above sea level. From this point to the Connecticut border is relatively all downhill. Next we were crossing Route 94 and almost immediately after the crossing we were greeted by some horses on the right. Please respect the fact that they are on private property. As Old Snake Hill Road continues downhill it soon becomes a rocky dirt road trail. 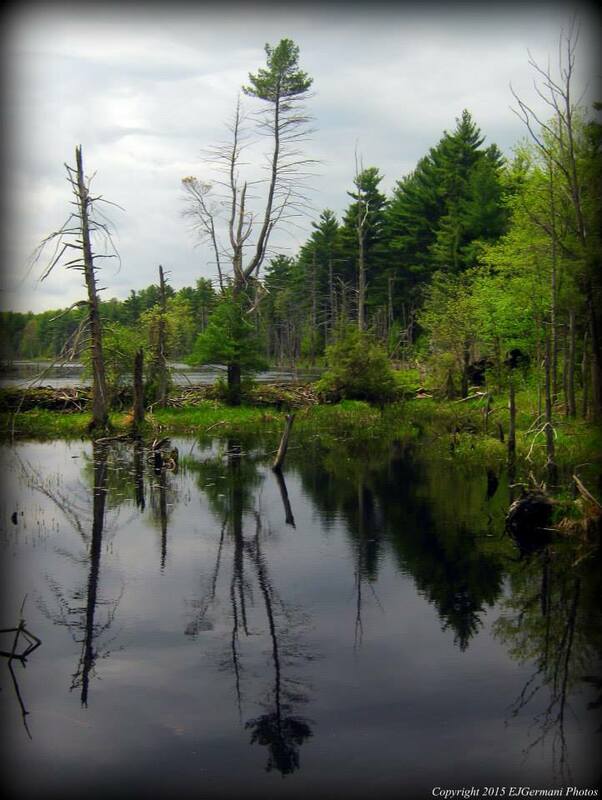 The trail soon splits and the North South Trail turns to the left into the Killingly Pond Management Area. After a few bends the trail splits again to the right. This area was full of features such as stone walls, a small stream crossing the road, some chipmunks, toads, and butterflies, all before coming to a slab bridge that crosses the Mowry Meadow Brook. We decided to stop here for a break and take in the beauty of the brook and surrounding area. From this vantage point we could see a beaver dam that made the brook look more like a river. After our break we continued west toward the state line. We did stop briefly to look for a state line marker that was called for on the map but we did not find it. As soon as we crossed into Killingly the trail began to climb uphill once again. We then came to a narrow path on the left where we turned and continued to follow the blue blazes. At the end of that trail we turned left onto Pond Road, which is gravel at this point, passing Killingly Pond on the left. The road soon becomes asphalt, passes Dam Road, and shortly thereafter we concluded this leg of the hike at the intersection of Pond Road and Riley Chase Road. Mowry Meadow Brook In The Killingly Pond Management Area. This leg, 8 miles in distance, is almost all road walking. There is a short 1.6 mile stretch that is a trail. The roads though are less traveled country back roads with an abundance of scenery, so much so that I was surprised by some of the sights. Continuing from Pond Road we followed Riley Chase Road, a gravel road flanked with stone walls in many sections, 0.6 of a mile to Route 101. The road then becomes paved just before it reaches Route 101. Entering into Foster, there is an old sign, barely readable, here at the state line as we crossed back into Rhode Island. After crossing the state highway we followed East Killingly Road as it weaved along the state line. Along this stretch we saw some old farm equipment being overtaken by the tall grass and some old farm buildings on the right. A little further on the left we were greeted by some goats. Following the blue blazes we turned right onto Shippee Schoolhouse Road. There is a historic cemetery on the right. Most of the graves are that of the Shippee family. This stretch of the hike proved to be quite surprising, we happened to see an owl fly over the road and then minutes later a red fox sunbathing on the front lawn of one of the homes. Needless to say as we approached the fox got up and ran away into the woods nearby. Soon we were passing the Grass Property owned by the Foster Land Trust and then turning left onto Tom Wood Road. Two more Foster Land Trust properties run along Tom Wood Road. They are the Sainio and Scheinder properties. Ironically, Tom Wood Road is the 1.6 mile stretch of trail walking. Almost immediately after turning onto the trail a small pond appears on the left. Here on the right is the remains of an old shingle mill. At the time of this hike there was signage briefly explaining the history of the site. Ahead the road veers left into the land trust property. It will rejoin later. The North South Trail here stays on the narrow trail climbing slightly uphill along the rocky terrain. There are several splits after the road rejoins the trail. We continued to follow the blue blazes making sure to stay on the North South Trail as it came out to the back of the Shady Acres Restaurant. Along this section the trail follows stone walls and passes small grove of mountain laurel. The next mile and a half would be walking on paved roads once again. After stopping for a short break at the restaurant, we crossed and then followed Route 6 west about 0.4 miles as traffic buzzed by at 50 to 60 miles per hour. We then turned left onto Boswell Road passing the Little Rhody Vasa Park before turning left once again onto Salisbury Road, a gravel road. Heading east along this road we walked by a couple farms and a couple small ponds, one with a beaver lodge. This is a very picturesque stretch with sweeping grass fields and stone walls. We then turned right onto the paved Balcom Road and followed it to the intersection of North Road where we concluded this leg of the hike by Borders Farm. Borders Farm, Scenery Along Foster’s Back Roads. Although the fifth leg was all road walking through Foster and into Coventry, the scenery of the area adds to our statewide hike. Starting at the intersection of Balcom Road and North Road in Foster we continued south up a slight hill. The road soon turns from pavement to gravel and the old street signs continue to appear on these less traveled roads. Along the road on the left is the first of several barns along this leg of the hike. Turning right onto the paved South Killingly Road began to climb up Bennett Hill. The road is flanked by stone walls along this stretch. At the top of the hill is a large barn and farm with a view to the south. As we continued west and downhill we passed the Walker Property which is owned by the Foster Land Trust. Turning left onto Johnson Road we came upon a fenced in area with several alpacas. They seemed just as interested in us as we were of them. Just ahead on the left we were greeted by a pair of horses as we stopped to check out a historical cemetery. Just beyond that we stumbled upon the Eat Me Acres Farm. Johnson Road is nearly 3 miles long as it winds through southern Foster. We passed several open fields (some with crops of corn), a few ponds, another cemetery, and passed through the Foster Country Club. 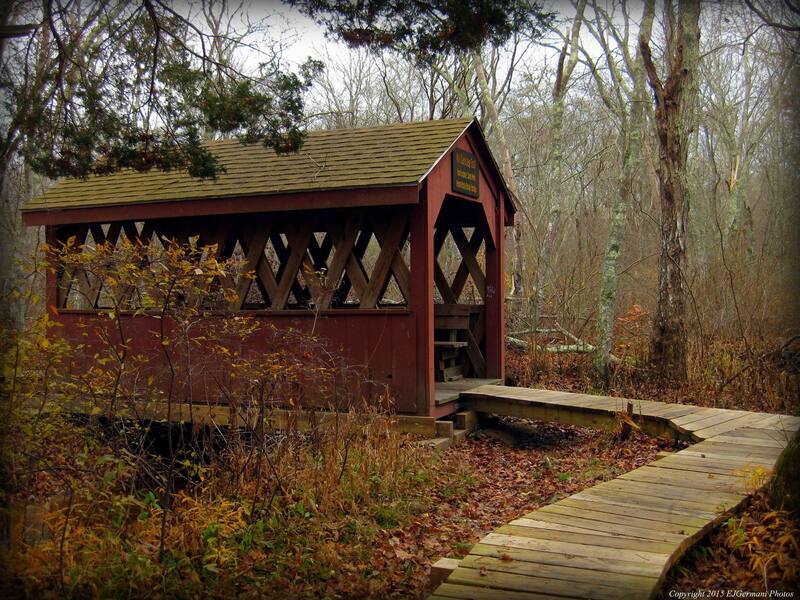 At the country club you will see one of only a few covered bridges in Rhode Island. We also saw a deer in the nearby woods along this stretch. We then turned right onto a very busy Moosup Valley Road. Traffic buzzes by quite quickly on this stretch, be sure to exercise caution. This stretch is about six tenths of a mile and passes a fire station on the left. We then turned left onto Potter Road. It is a gravel road that is to the east of the Moosup River. We came upon some guinea hens at a home on the right just in the area of the “trees with eyes”. The road starts to approach closely to the river just before it bends to the left. On the right at this point there is a cellar hole, possibly an old mill site. If you look closely enough you will be able to see the river through the woods. After the road bends to the left and then back to the right we approached the town line. It is actually quite definitive although not marked. When you leave the woods and enter the large open field you have left Foster and entered Coventry. Soon the road passes an area with several shrubs. At the time of this hike the shrubs were bearing berries and there was an abundance of birds. We then turned left onto Vaughn Hollow Road. The road, paved, climbs up hill for a while first passing a cemetery, then a unique building covered in street signs, before coming to the historic village of Rice City. Continuing through the village we passed an old white church, an old school house, and the Obadiah Potter House built in 1804. We next turned right onto the Plainfield Pike, another main road, and made the final push of this leg. Along the way we passed a couple more barns and very characteristic houses. After crossing the Moosup River we concluded this leg of the hike at Place Farm. Moderate due to distance, some road walking. Starting at Place Farm, we immediately found ourselves on trails once again as we entered the Nicholas Farm Management Area. The first section of the narrow trail weaved through a forest of pines with a fern covered ground. The trail then crossed a large field before returning to the woods for a bit. 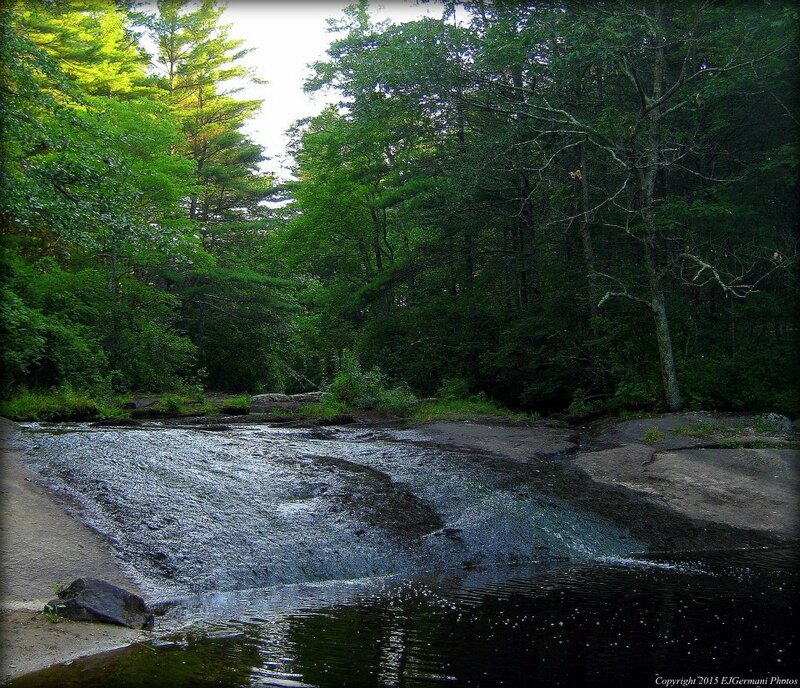 Soon we reached Spencer Rock, a large outcrop that crosses the span of the Moosup River and creates a waterfall. It was a near trickle at the time of this hike, but after a good rain it has a decent flow. The trail then turns away from the river briefly, comes to a clearing and turns left. 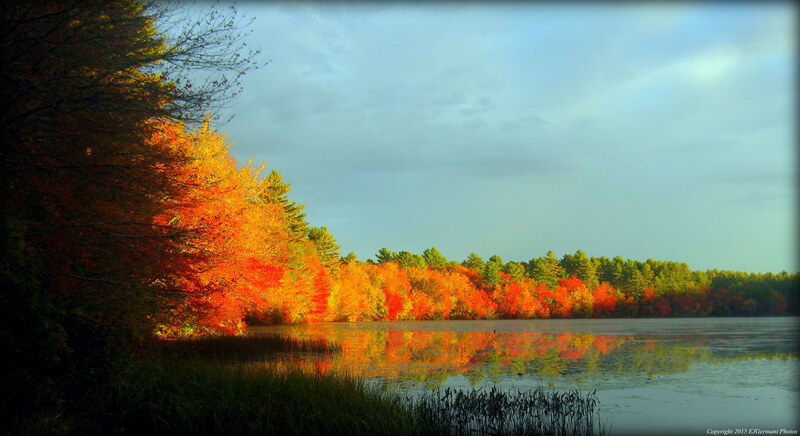 The trails that continue straight will lead you to Carbuncle Pond. After turning left the trail climbs slightly uphill, through another field and back into the woods. Soon the trail turns left onto the aptly named Trestle Trail. *** DETOUR 2019/2020*** SEE END OF THIS SECTION FOR MORE INFO*** For now the Trestle Trail is an old railroad bed, but there are plans to continue the bike path that runs through Coventry to here. We were soon crossing and old railroad trestle the spans the Moosup River before turning right onto Lewis Farm Road. 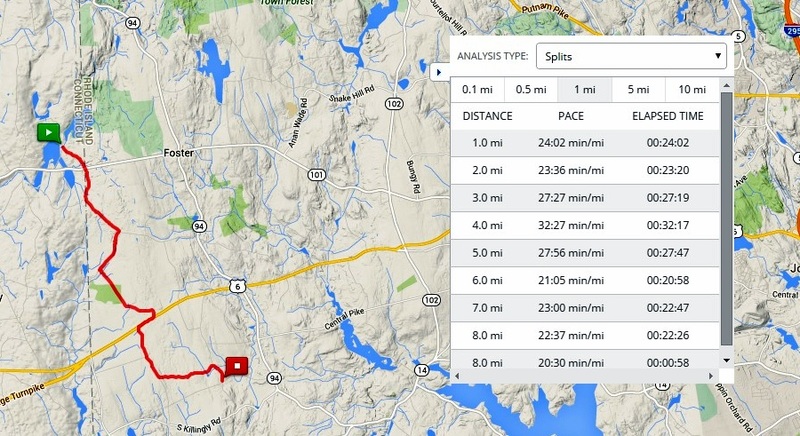 We next turned right onto Nicholas Road, first passing a gravel pit, a few fields, and then crossed Roaring Brook. Soon after the brook crossing a parking area for Nicholas Farm is on the right. Between the parking area and the road is a large cellar hole and foundation. At the next intersection we stayed to the right following the blue blazes along Nicholas Road. Soon we were turning left onto an old cart path that climbs uphill. This stretch through the southern portion of Nicholas Farm climbs over a hill, features stone walls, and is flanked by low shrubs including blueberries. After climbing to the top of the hill the trail descends down a rocky section. To the right is an area being cleared for environmental purposes. Soon we approached the mid point marker, took a short break, and relished in achievement of completing half of our journey. Carrying on we then turned left onto Newport Road. *** DETOUR ENDS*** At this point we were only a few hundred feet from the Connecticut border once again. Next we turned right onto Hazard Road (also known as Molasses Hill Road) and followed it to the endpoint of this leg. The road is bordered by stone walls on each side as you head toward the town line. 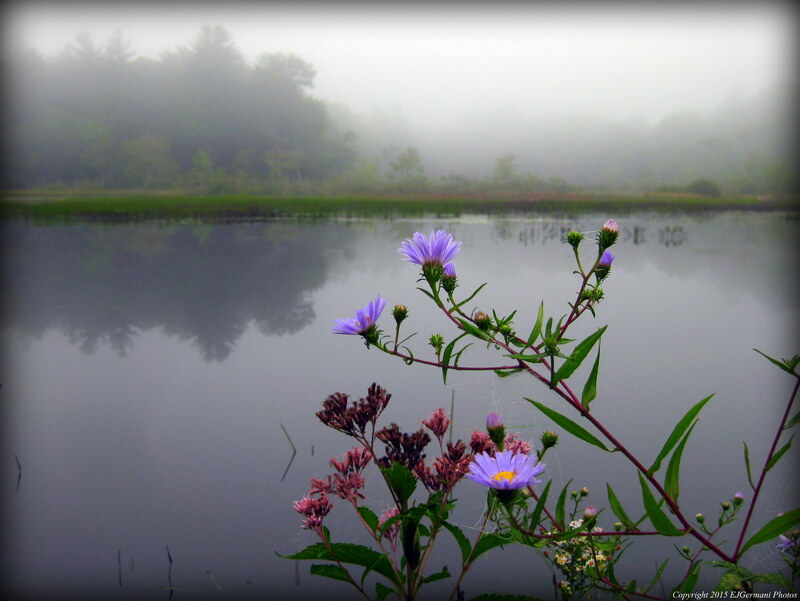 At the West Greenwich border the road becomes paved and shortly after on the right is a pond full of lily pads. There are a few more barn buildings on the left and soon on the left, just before the road bends to the left, is the entrance to the McAlpine-Shepard Preserve. 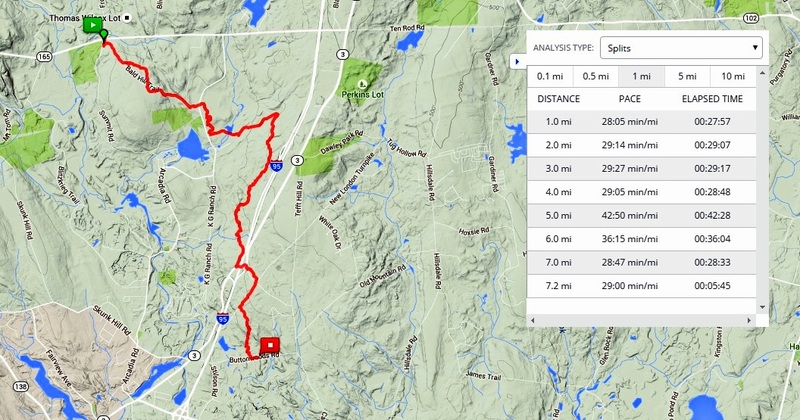 It is one of the newest trails in the state and effectively connects the North South Trail to Tillinghast Pond and Wickaboxet creating a massive network of trails. We then continued southerly passing the site of an old school on the right followed by a stable with a few horses before concluding this leg at another historical cemetery at Hazard Road and Bailey Pond Road. Mid Point Of The North South Trail In Nicholas Farm Management Area. Due to construction along the Trestle Trail and the bridge that crosses the Moosup River, a section of the North South Trail is being detoured. Moderate due to distance, some muddy and rocky areas. Resuming our hike we continued down Hazard Road. 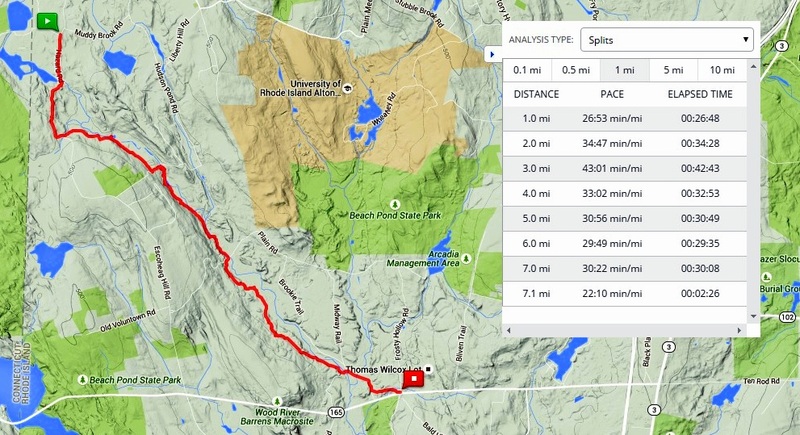 The first 1.3 miles of this leg would be along the paved road that occasionally offers a stone wall. On the right we soon passed Hazard Pond which crosses over into Connecticut. Just after the pond the road comes to an old farmhouse and then bends sharply to the right. On the right here you will see a root cellar. Hazard Road then continues southward and you will start seeing signs on the tress to the left marking the boundaries of the Arcadia Wildlife Management Area. Hazard Road then winds downhill and to the left and stream followed by a parking area appears on the left. The North South Trail enters the management area here and starts to follow a dirt road through tall grass. This area was once part of the Pine Top Ski Area, one of the few skiing spots in the state. The trail then enters an area of wildflowers before heading into the woods. At the next intersection the blue blazed North South stays to the left and descends slightly downhill. After passing the multi-split boulder on the right the trail gets muddy and most of it has been rerouted a few feet away. Also, along this stretch to the left is the Upper Deep Hole, a small pond with a stream that trickles to it. There is no trail that leads to the pond, but it is only a few hundred feet from the trail. Be sure to watch your step for both footing and poison ivy if you do choose to venture to the small pond. Continuing along the North South Trail, the trail becomes less muddy. To the right you will notice Escoheag Hill towering above the trail. Near the end of this trail you will see some rather impressive stone walls as well. Next we turned left onto Falls River Road and followed it to just before the bridge. On the right is a small parking area and the trailhead of the Tippecansett Trail. But here is also the highlight of this leg, Stepstone Falls, easily one of the most beautiful locations in Rhode Island. The falls vary greatly depending on recent weather. At times it is nearly thundering and at other times, like today, it is a mere trickle. After spending a little time here and taking a short break, we made it back to Falls River Road, crossed the bridge, and turned right onto the white and blue blazed River Trail. This aptly named trail follows the east side of the Falls River, crosses a bridge, and then follows the rocky west side of the river before joining the Ben Utter Trail. Turning left onto the yellow and blue blazed Ben Utter Trail, we were soon crossing several sections of small footbridges, boardwalks and stone stairs. Some of the bridges cross an old millrace that once served a long abandoned sawmill. The only traces left of the mill is a series of stone walls and foundations. There is also a section of the trail that goes through a tunnel of mountain laurel. We left West Greenwich and entered into Exeter as we neared the end of the trail. At the end of the yellow and blue blazed trail we turned right onto Austin Farm Road and followed that briefly before turning left onto the Sand Hill Trail. This trail blazed both white and blue is beautiful stretch of pine needle covered trail under a canopy of the tall trees. Soon there is a sign for the Escoheag Trail on the right which the white blazes follow. We continued straight along the blue blazed Sand Hill Trail, then keeping left at the next split where a spur trail leads to the right. The trail soon crosses over a boardwalk and slowly climbs uphill before coming the Barber Road. Turning left onto the dirt road, we followed it just under a mile to its end. Along the way on the left there is a short spur that leads down to the river for a view of it. The road then turns to the left crosses a bridge over the Falls River and we went to the right at the next intersection, following the blue blazes. On the right is a newly built wooden platform that overlooks the Falls River. We stopped briefly here before continuing on the road and crossing over the Flat River just a few hundred feet away. (The Falls River and Flat River converge to form the Wood River about a tenth of a mile south of this point). After crossing the Flat River we continued along the dirt road passing the Deion Trail on the left. Next we turned left, following blue blazes, onto the Hargraves Trail. The trail climbs uphill passing a stream before coming out to the West Exeter Baptist Church where we concluded this leg of the hike. 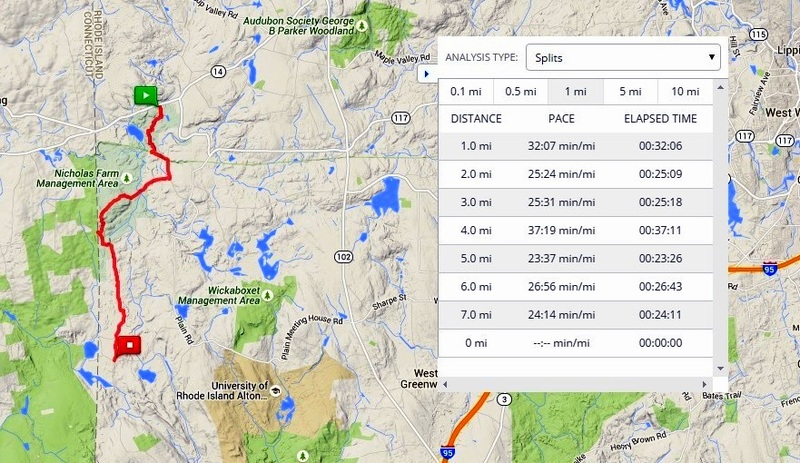 Moderate due to distance, some elevation changes and rocky terrain. This leg of the hike, just about all trails, traversed through the southern half of the Arcadia Wildlife Management Area. We started from the West Exeter Baptist Church on Route 165, crossed the highway, and followed Summit Road briefly, then turned left into the woods onto the blue blazed trail. We started a slow climb uphill for a bit first coming to one of the busiest trail intersections in the state. The seven trail intersection is where the white blazed Mount Tom Trail, the Dove Crest Trail, the Bald Hill Trail, and a few unnamed trails intersect. We passed straight through the intersection following the blue blazes along the Bald Hill Trail and continued the climb up the north then east side of Bald Hill. The trail finally levels out at about the half mile mark briefly before continuing to climb uphill. There is a cellar hole on the right where the trail levels out. Soon a trail appears on the right with a sign for the “Loop Trail”. The trail leads to the summit of Bald Hill. The North South Trail stays to the left and starts down the east face of Bald Hill. The yellow blazed Arcadia Trail comes in for the left next and joins the North South Trail. The two trails will remain together (except for a short stretch near Tefft Hill) for several miles. Just after the trail junction there is a watering hole to the right. Shortly after that you will see the first of some of the boulders in this portion of Arcadia. 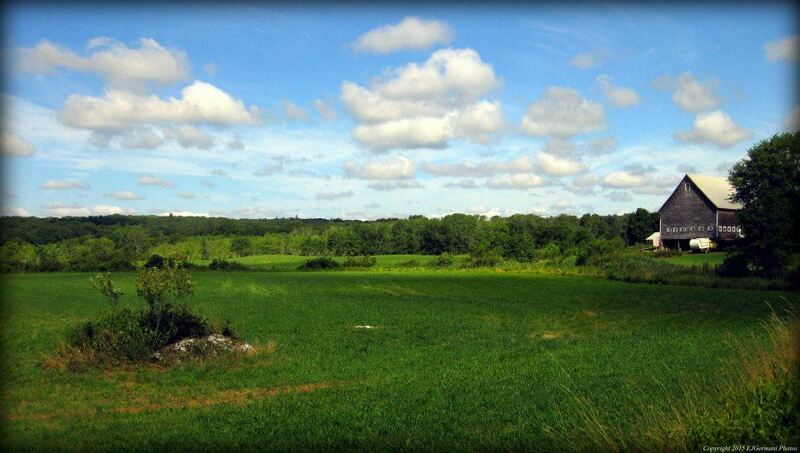 The trail then comes out to Bates Schoolhouse Road, The gated Sandy Brook Trail is immediately to the right and leads back up the south face of Bald Hill. Continuing ahead and to the right, the North South Trail follows Bates Schoolhouse Road for a bit before turning left onto a narrow trail. We then crossed Arcadia Road, meandered through a rocky area with a pine needle covered trail, crossed a boardwalk, and passed stone walls. 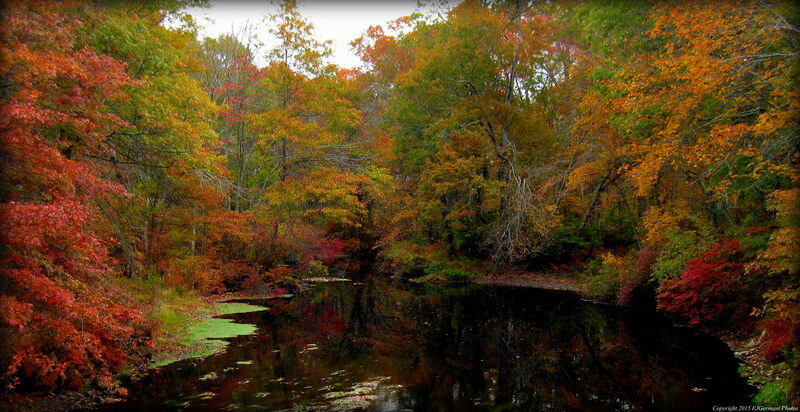 The trail then follows a boardwalk as it passes the picturesque Roaring Brook Pond. After passing the pond we continued straight then turned left onto the Tefft Hill Trail. There is a watering hole on the left and then the yellow blazed Arcadia Trail splits off to the left. We continued along the blue blazed trail as it climbed up the west side of Tefft Hill. The North South Trail then makes an abrupt right turn onto a narrower trail. Be sure to keep an eye for the turn. This is also where the Arcadia Trail rejoins the North South Trail. The two trails, blazed blue and yellow, will travel along the west face of Tefft Hill for nearly two miles. At the next intersection the blue and yellow blazed trail turns to the left and heads into Richmond. Ahead we passed another white blazed trail called the Arcadia Crossover Trail. We continued to follow the blue and yellow blazes along a trail through maple, oaks, and beech trees, that meandered through the fern covered forest, boulders, and some cairns. We then approached another of the highlights of the hike. There is a short and challenging section called the “Boulder Field” in which you need to climb and scramble over boulders. (There is a spur trail here that passes around the boulder field if you so choose to). Ahead is a small stream crossing at Baker Brook with the remains of a bridge. In the concrete you will find an interesting display of pebbles and stones placed in the concrete. At the next intersection the blue blazes turn to the left as the yellow blazed Arcadia turns to the right. Following the blue blazes we were soon getting very close to the Interstate. The trail the comes out to a gravel road that leads to Nooseneck Hill Road (Route 3). Turning left we walked under Interstate 95 and then crossed the road, and turned right onto Baker Pines Road. This is a dangerous spot as fast travelling vehicles pass around a curve with a significant blind spot. Be sure exercise caution crossing Route 3. We then continued along the paved road for about three hundred feet and turned left just before utility pole 3. This narrow trail parallels Bakers Pine Road then crosses it before coming to an old gravel road with utility poles running along it where we turned right. This road is the old New London Turnpike and was one day the main highway between Providence and New London. Today, it is used as a trail. The remainder of this stretch is significantly downhill as we followed the old road about three tenths of a mile before turning left. The final stretch of this leg follows a beautiful rocky trail that winds down hill to the east of Moonshine Swamp. 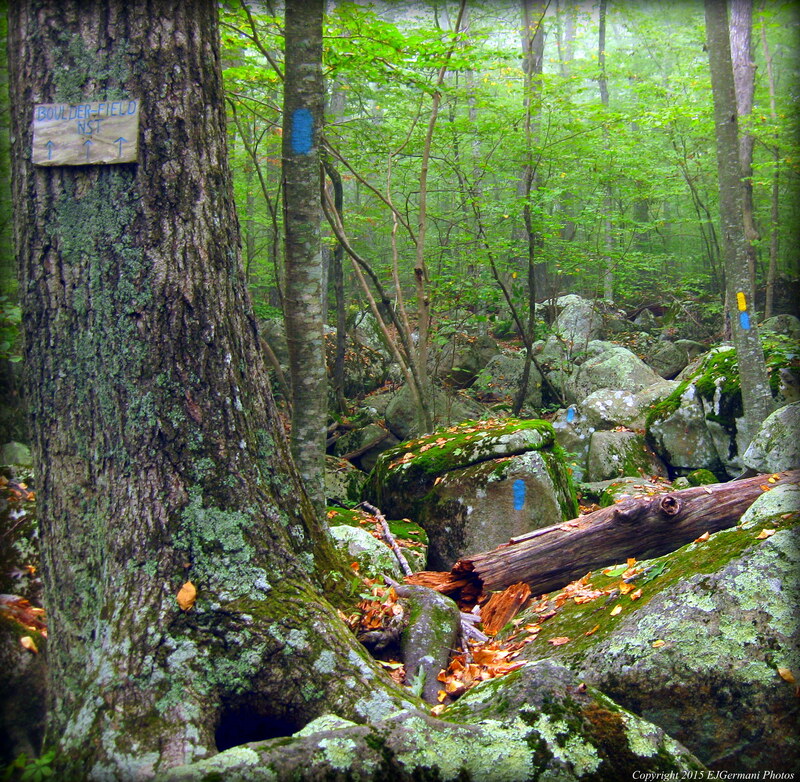 Be sure to follow the blue blazes as there are several unmarked trails in this area. At the end of the trail we turned left onto Buttonwoods Road and concluded this leg at the Richmond Dog Park. Moderate, several miles of road walking. This leg of the North South Trail started with 3.7 miles of paved roads before getting back onto the trails. Much like the road walking stretches through Foster and Coventry, the roadside attractions kept the hike interesting. Picking up where we left off at the Richmond Dog Park we headed east, following the blue blazes, along Buttonwoods Road, passing a gravel pit on the right, before climbing a short but moderate hill. Soon we came to Carolina Nooseneck Road where we turned right. Here at the intersection is a small pond with some miniature tug boats in it. Continuing south along Carolina Nooseneck Road we soon crossed for the first time Meadow Brook. To the left the sun was peeking through the trees over Bailey Hill. Part of the property to the left is a large and sprawling property the was bequeathed to the State of Rhode Island by the estate of Theakston deCoppet. After a short bend the road then goes downhill a bit and on the left are stonewalls, ledges, and boulders. 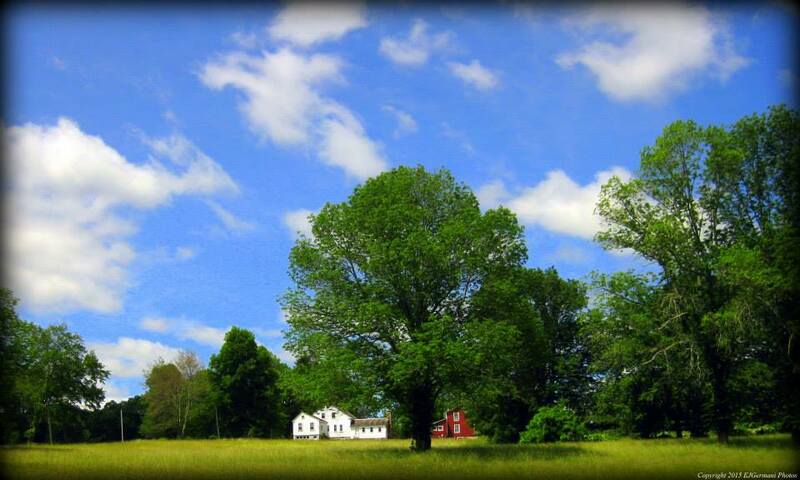 An open field soon appears on the right just before the Meadowburg Farm. Soon we were turning right onto Route 138 passing the Richmond Town Hall, The Richmond Elementary School, and a single room schoolhouse. This building, known as the Bell School, is the home to the Richmond Historical Society and was built in 1826. Continuing west along Route 138 we then passed the Meadowbrook Golf Club and crossed over Meadow Brook once again. Use caution while walking along the state highway as this stretch of the hike is in an area of heavy traffic. Next we turned left into a subdivision following the blue blazes to the end of Meadowbrook Road. At the end of the road on the left is a horse stable. The North South Trail then follows a private driveway for a couple hundred feet. There is a sign here stating that hikers, bikers, and equestrians are welcome. This is the beginning of the Meadowbrook Trail. It leads southerly to Kenyon Hill Road passing through areas of beech and pine trees for about a half mile. After crossing Kenyon Hill Road, the North South Trail follows a dirt road that is essentially a shared driveway. The road leads you by a few homes and some open field before winding its way into the northern section of the Carolina Management Area. Be sure to follow the blue blazes as not to miss the turn into the management area. Once in Carolina the trail narrows and there is a massive ledge to the right. Soon there is an intersection and the blue blazes indicate a turn to the left. If you are carrying the Great Swamp Press map or a copy of the Cliff Vanover North South Trail book, you will notice the option to turn right here for an alternate route. We opted to stay to the left and follow the blue blazes along the Meadowbrook Trail. Next we passed what appeared to be either a water hole or a cellar hole for an old mill before the trail widened to a dirt road once again. There are a couple dirt roads to the left that lead to the brook. The trails to the right lead further into the management area. 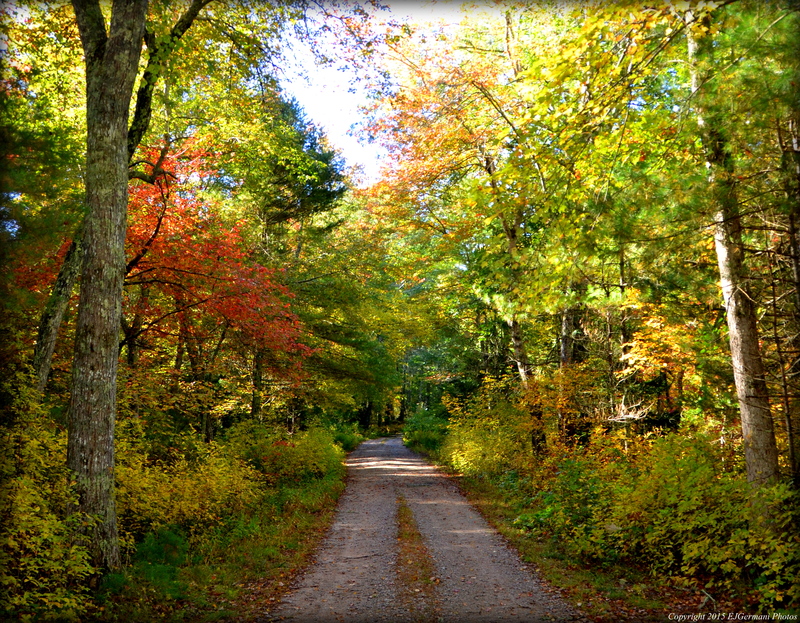 We continued straight along the dirt road under a canopy of yellow beech and red maple leaves nearing peak foliage. We then turned left onto Pine Hill Road, crossing Meadow Brook for the third time, then passed the Carolina Hunter Check Station, and walked about another three tenths of a mile to the parking area at the trail head of the White Brook Trail. This is where we concluded this leg of the hike. Along The Meadowbrook Trail In The Carolina Management Area. Moderate, several miles of road walking with some hills and areas of rocky footing. This leg would be the longest of the eleven legs of this hike. Starting just before sunrise at the White Brook Trail trail head, we made our way into the southern portion of the Carolina Management Area. 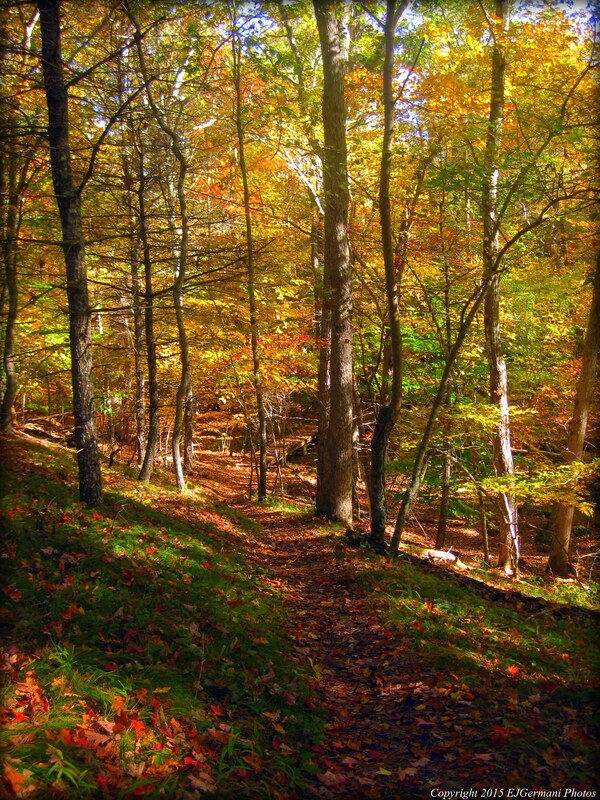 The trail weaves through an area of tall pines and vibrant yellow beech trees. It was a cold and grey morning with a touch of frost on the ground. The foliage, however, was still near peak in these areas. Along this stretch we came upon the first of several hunters. He was perched up in a tree in full camouflage waiting for his prey. Unfortunately for him, he would probably have to wait a little longer. Next we passed a trail to the right and soon after we came to a historical cemetery on the left. The cemetery is surrounded by a picket fence and has graves dating to the late 1800’s. Continuing to follow the blue blazes the trail then turns right at the next intersection and starts to descend downhill before climbing up and over another small hill. Soon we would come out to the large open fields of Carolina and the trail turns into a farm road. Again we ran into hunters in the tall grasses and mowed corn fields. I briefly stopped to talk to one and found that they were hunting dove. Keeping to ourselves we continued following the occasional sign for the North South Trail as we heard the sporadic discharge of firearms. The blazes become far and few between along the large open fields but the farm road continues fairly straight through here. Ahead on the left are the remains of an old barn. It is nothing but a pile of rubble now. Here the road starts to turn to the right and comes to an intersection. Stay to the right here. There is no blaze at the intersection. On the right you will notice a large and vast field that is used to grow turf. There is a massive irrigation system here. The farm road continues to follow the tree line for a bit before coming to the next intersection. Here we turned left onto a dirt road and then turned right onto a short trail that leads through the woods. At the end of this trail is the parking area at Meadow Brook Pond. After taking a short break to view the pond, we began our road walking stretch of this leg. For the next 2.8 miles we would walk on paved roads that wind through Richmond and into Charlestown until we reached the Burlingame Management Area. We first headed west on Carolina Road passing the tiny Wood River Junction Post Office, then turned left onto New King’s Factory Road. After turning onto the road look for the cell phone tower on the right. There is a large nest at the top of it. The road climbs uphill to a bridge that crosses the railroad tracks. If your timing is right you may catch a glimpse of the Amtrak train as it buzzes by at speeds of 100 to 150 miles per hour. The road then descends and turns slightly to the right. The next bridge crosses the Pawcatuck River as we entered Charlestown. On the left just after the bridge is land that is part of the Francis Carter Preserve. The Nature Conservancy has just recently acquired this land along the river and plans on extending the existing trail system on the property. Continuing straight along King’s Factory Road we then passed under power lines and over Cedar Swamp Brook before turning right opposite an old red barn. There is no street sign here. The road starts a long and steady climb uphill passing the Stoney Hill Cattle Company and a couple of farm fields. The road then curves left, continuing uphill, passing several homes and stone walls. When we reached Gooseberry Farm we turned right onto Burdickville Road and followed it for about a quarter of a mile. This would be then end of the road walking for a while. We then turned left into the northern part of the Burlingame Management Area. The trail is very rocky and the footing can be a little rough as it climbs to the peak of Shumunkanuc Hill. This stretch offers some ledges and stone walls as well. When we reached the peak we came upon an intersection. Here we turned left following the blue blazes. This trail, about one and a half miles long, is the Clawson Trail. It passes a small pond on the left before coming out to a parking area at Buckeye Brook Road. We then crossed the road and continued back into the woods. Soon we came to a trail intersection with yellow blazes. 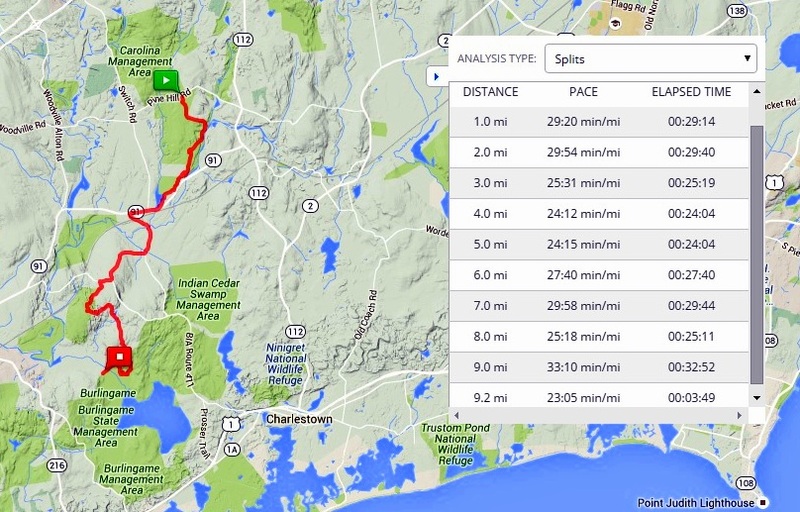 This is the 8 mile Vin Gormley Trail that loops around Watchaug Pond. Here we turned right and for the remainder of this leg followed both the blue and yellow blazes. For the next three quarters of a mile we passed some stone walls and some impressive ledges. At one point we needed to do a little climbing as the trail passes over a rather rocky area. The trail then emerges back onto Buckeye Brook Road where we turned left, passed over Poquiant Brook, and followed the road for a quarter of a mile where we concluded this leg of the hike. 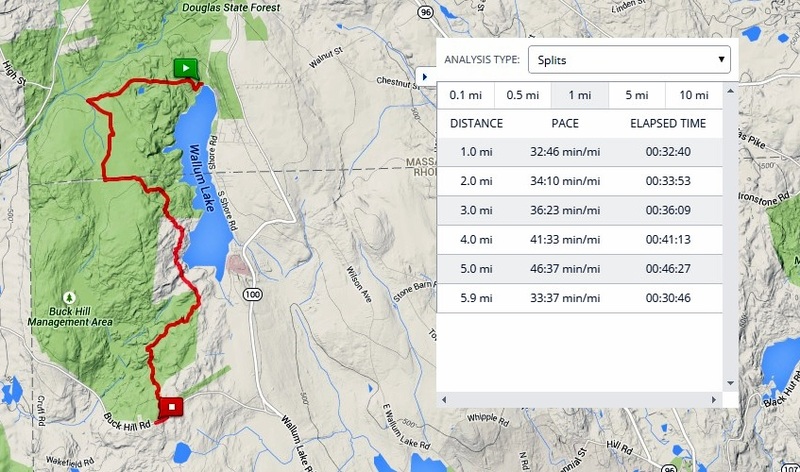 Fairly easy, some slight elevation and some road walking. Many sections of the North South Trail pass through areas where hunting is allowed. Please be aware of the hunting regulations and be sure to wear the proper amount of orange if you should hike in these areas during hunting season. I would like to thank Auntie Beak for her help with the planning and logistics of this hike. It has been a pleasure to take on the North South Trail in its entirety with you. Moderate, difficult in areas due to significant elevation. 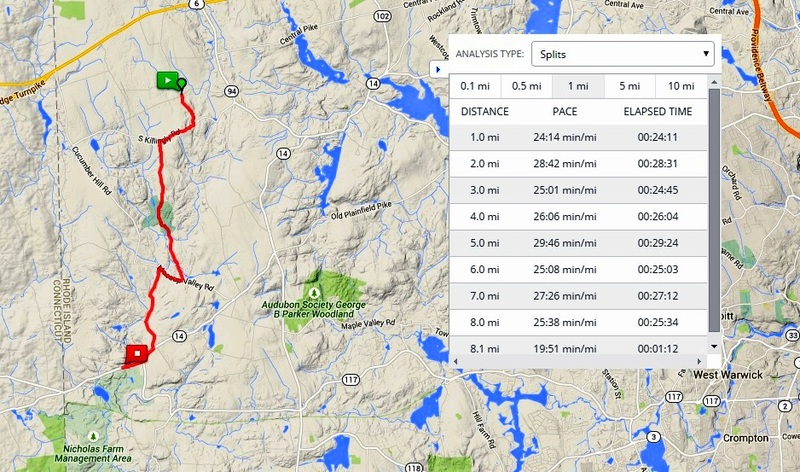 The Breakheart Trail runs from Austin Farm Road at the Falls River to Breakheart Pond mostly in West Greenwich and parts of Exeter. This hike covers nearly all but the western most half mile or so. The route that we followed for this hike is the one in the Ken Weber “Walks and Rambles in Rhode Island” (Third Edition), however we chose to do the hike in reverse. The reasoning was a hiking club decision to eliminate the two miles of road walking first and to save the actual Breakheart Trail for the remainder of the hike. We started from the parking area by Breakheart Pond and started our two mile westward trek along Austin Farm Road. The road, at times flanked by stone walls, is a dirt road that first passes Frosty Hollow Road, then passes the Fish and Wildlife Education Offices before coming to the Flat River. On the left at the Flat River Bridge is a historical cemetery. A little further up the road there are yellow blazes on trees. These are not the blazes for the Breakheart Trail. Just after the two mile mark there is a sign to the right that reads “Hiking Only”. Just beyond that sign is the trailhead sign for the Breakheart Trail. The remainder of this hike follows the yellow blazes of the Breakheart Trail as it winds through the most secluded parts of northern Arcadia. There are some spurs and intersections along the way. Be sure to be aware of the blazes as not to take a wrong turn. The trail starts a steady and at times difficult climb up Penny Hill. This is one of the highest points in Arcadia and at one time had sweeping views of the area. The trees have now grown higher than the hill. Folklore has it being named by hikers in the 1930’s that would drop a penny in an abandoned bird nest at the top of the hill. The trail briefly splits and rejoins just to the east of the hill and then starts to descend downhill first passing the intersection for the multi-use trail before coming to the white blazed Penny Cutoff Trail on the right. Continuing straight the trail then passes through an area with several dead trees and low shrubs. At the next intersection is the white blazed Shelter Trail on the right. The Breakheart Trail then winds through some of the prettiest parts of the management area passing under a canopy of tall trees. There are a few boardwalks and the trail crosses Phillips Brook before coming to the wooden truss bridge that crosses Acid Factory Brook. This is a good spot for a break. The brook trickles over some rocks here and you are approximately a mile from the closest public road. You will notice signs on the trees stating “No Trespassing”. This is the boundary between Arcadia and the University of Rhode Islands Alton Jones Campus. After crossing Acid Factory Brook the trail then climbs yet another hill. This stretch is quite rocky and there are plenty of boulders. Be sure to follow the yellow blazes at the intersections. When you reach to dirt road your uphill climbing is all but done. The Breakheart Trail then descends southeasterly downhill soon coming to a brook on the left. At the next intersection we turned left following the yellow blazes over a wooden bridge at the extreme northern end of Breakheart Pond. After a short uphill section, the yellow blazes turn to the right and follow a trail along the eastern side of the pond passing a small stream and waterfall. Shortly after that is a cellar hole on the right. Finally there is a sweeping view of Breakheart Pond with its dam and waterfall before concluding the hike at the parking area. Hunting is allowed here. We ran into several hunters along this hike, particularly in the parking areas along Austin Farm Road. Be sure to wear blaze orange during hunting season. This small town owned property just off of Twin River Road in Lincoln offers quite a bit. The trails are wide and easy to use. There are several areas to stop and sit on a bench including a small picnic area right on the shore of the reservoir. 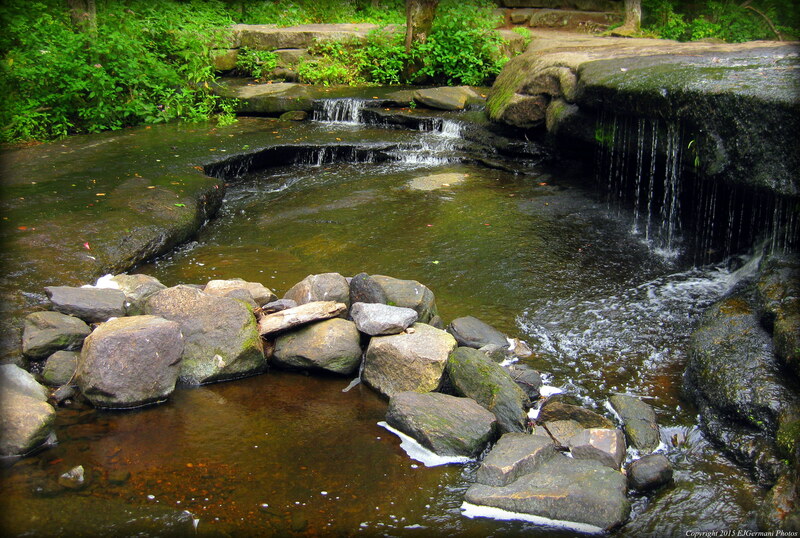 And lastly there is a small babbling brook, actually it is a river, that you can enjoy. There are several options with a main loop and a couple cut through trails. Starting from the parking area the trail goes southward toward the reservoir. At the first intersection a trail goes to the right (I would return on this trail), I opted to go straight. The trail then splits again. This time I stayed to the left. The main trail is wide as it traverses through tall trees. There are some boulders just off the trail in the woods as well. Soon I approached a narrow trail to the right. Here I continued straight following the main trail. At the next intersection the trail to the left is barricaded. It leads to private property. Turn right here and soon you will start seeing the reservoir. The trail then bends to the left and again to the right. Here to the left is the shore of the reservoir and a small picnic area. The trail continues to the right. Continuing along the trail it starts to turn to the left before the next split. At the split stay left. Soon I was walking along the West River. There are some spots to view the trickling waterfalls of the river. The trail then starts climbing slightly uphill to an intersection. I turned right here and continued uphill away from the river. Just before the two large stone pillars start looking for the trail on the right. Beyond the pillars is private property. After turning right, I followed the trail a short distance to the trail I entered the property on. I turned left and retraced my steps back to the parking area. Small Waterfalls Along The West River.